In general, only hardware-related issues should be sent in to DTS. If you’re not sure, select “On-Site service” on the iPad Work Request form or call the Help Desk. IMPORTANT: If an iPad repair is hardware-related, it will need to be sent off-site for evaluation and a cost estimate for repair. If a student has insurance, a replacement iPad will be expedited for return. If the student does not have insurance, or if their first insurance incident has been consumed, this process may take 2 weeks or more. DO NOT include charger or cable. If charger or cable is damaged, the student should purchase a replacement from school stock. (The information on completing these steps will be mailed to the person who submits the work order). Place the iPad in an envelope, print and attach the shipping label to the front and store in a secure location for pickup by DTS. Print the shipping label and attach to the iPad. Deliver the iPad to the Help Desk, DTS (2929 Clover Basin Drive, 2nd floor, Longmont) during normal work hours (7:00 AM – 4:00 PM). DO NOT deliver iPads to DTS via regular warehouse or school mail delivery pickups. How does DTS determine if a repair fee is required? Once the iPad is received, DTS will determine if there is a cost for the repair and enter that information into IC/RevTrak. This information will be communicated to the person who submitted the work order so that the parent can be notified of the cost or use of first insurance incident. Because the cost of repair may have to be assessed by the company performing the repair, it may take up to two weeks. The iPad or a replacement will be returned to the school along with a note letting you know there is no charge to the student Remember to notify the parent of the service. 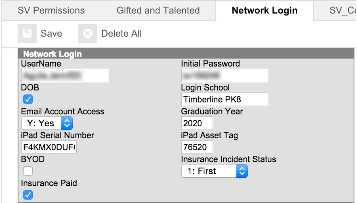 First instance: The insurance assessment will be changed to first for the student by DTS (on the iPad Management tab in IC). The iPad or a replacement will be returned to the person who submitted the work order along with a reminder to notify the parent of the claim. Second instance: The insurance assessment will be changed to second for the student by DTS and a fee will be assessed to the student in IC/RevTrak.The cost of the repair (up to the maximum covered for a second repair) will be communicated to the person who submitted the work order along with a reminder to notify the parent of the claim and the fee. Third and following instances: The insurance assessment will be changed to third for the student by DTS and a fee will be assessed to the student in IC/RevTrak.The cost of the repair will be communicated to the person who submitted the work order along with a reminder to notify the parent of the claim and the fee. A fee will be assessed to the student in IC/RevTrak by DTS. The cost of the repair will be communicated to the person who submitted the work order along with a reminder to notify the parent of the fee. What happens if a student does not or cannot pay the fee? No replacement iPad will be issued until a student has paid any outstanding repair fees. Outstanding fees for repair will carry over to the following calendar year and across schools in the district. At the discretion of the school, you may choose to assign a loaner iPad for temporary use as needed. If a family cannot afford the cost of the repair fee, the school may assign service in lieu of payment with the goal being to reinforce student responsibility for care of the device. Your school can determine the type and amount of service appropriate. A good guideline would be an hour of service for every $10 of fees, with a maximum of 15 hours of service per incident. A student iPad will be reissued and the repair fee will be considered fulfilled once the school has informed DTS that the service has been completed to satisfaction. What do I do when the repaired iPad or a replacement is delivered to the school? Also contact the parent to make them aware of the replacement so that they can reset restrictions if needed. What are the guidelines for the school loaner fleet? Each school is assigned one loaner iPad for every 125 students. These should be kept in a secure location and be charged for use when needed. Schools will need to use their discretion in determining whether students with a device in for repair should check the loaners in and out daily or be allowed to take them home. When a student is assigned a loaner, be sure to check it out to them in Destiny and check it back in when their iPad is returned to them. Upon return of a loaner, reset the device so that it is ready for the next user. What are some resources available for student tech teams? Some schools are leveraging student tech teams and self-help tech areas to provide basic tech support and training resources for students and staff. Below are some links to resources from some of our schools.